Sorry... the 2017 Nissan Pathfinder is no longer being sold as new. 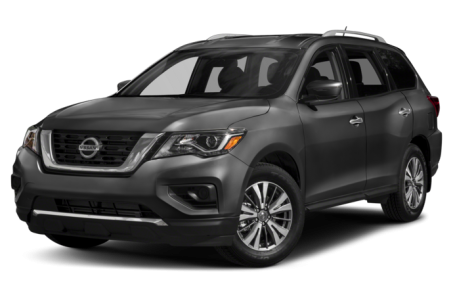 Instead, take the first step to a great deal on 2019 Nissan Pathfinder with a free price quote! The 2017 Nissan Pathfinder is a full-size SUV that seats 7 passengers across 3 rows. It competes with the Honda Pilot, Toyota 4Runner, and Ford Explorer. This year, the Pathfinder has been completely redesigned. Overall, the Pathfinder has a muscular design with its bulging fenders. The front-end features geometric headlights, a bold, V-shaped grille, and a rugged-looking diffuser. The B- and C-pillars as well as the underbody are blacked out. LED daytime running lights, power side mirrors with turn signal indicators, roof rails, and 18-inch alloy wheels come standard. Available features include LED headlights, front fog lights, a power liftgate, a trailer hitch receiver, and 20-inch alloy wheels. Under the hood, the Pathfinder features a standard 284-hp, 3.5-liter direct-injection V-6 engine mated to a continuously variable automatic transmission and front-wheel drive (FWD). 4-wheel drive (4WD) is also available. Making 259 pounds-feet of torque, the Pathfinder has a maximum towing capacity of 6,000 pounds. Fuel economy for FWD models is an EPA-estimated 20/27 mpg city/highway. It slightly lowers to a 19/26 mpg rating with 4WD. Inside, the Pathfinder has a standard cloth interior with a 60/40 split-folding second-row seat and a 50/50 split-folding third-row seat. Maximum cargo capacity is 79.8 cubic feet with the second and third row seats folded down. The center stack features a Nissan Connect multimedia system that includes an 8-inch touchscreen, Bluetooth connectivity for phone and audio, a satellite radio, and HD radio, and dual USB ports. It can be upgraded with an integrated navigation system, Apple CarPlay/Android Auto compatibility, and a Bose premium audio system. The cargo area has room for underfloor storage and multiple tie down anchors. Standard features include tri-zone automatic climate control, remote keyless entry, and push-button start. Available feature includes leather upholstery, a leather wrapped steering wheel remote vehicle start, heated/cooled front seats, heated rear seats, a dual panoramic moonroof, and a rear entertainment system. Standard safety features include an advanced airbag system, antilock brakes, an electronic stability system, a backup camera, and a tire pressure monitoring system. Available features include a surround view monitoring system, a blindspot monitoring system, rear cross-traffic alert, adaptive cruise control, and forward emergency braking. 48 of 50 (96%) consumers said they would recommend this vehicle to a friend.